FlexNet Code Aware is an automated open source risk assessment and package discovery solution that enables software developers to quickly scan their products for security and intellectual property (IP) compliance risk. 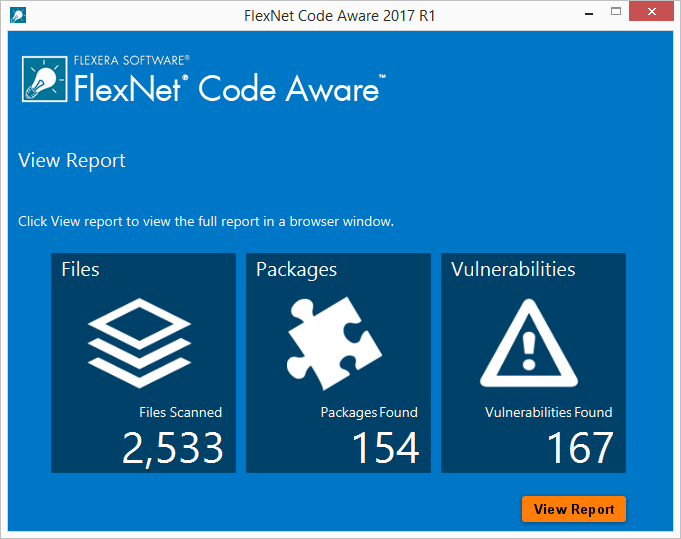 Either as a standalone, or by seamlessly integrating with InstallShield and InstallAnywhere, FlexNet Code Aware becomes a standard part of the build process, helping developers expose and assess IP and security vulnerability risks before the product ships. While not a virus scan, this powerful combined solution sets the foundation for a vulnerability-free build and error-free installation. We’ve all heard the stories – the software products that had to be pulled from the market. Or the undiscovered security vulnerability (remember Heartbleed?) that put millions of software users at risk. Don’t let this happen to one of your products. More than 50 percent of the code found in most commercial software packages is open source, and most organizations typically know less than 10% of what is actually used. Make FlexNet Code Aware a standard part of your build process to deliver a professional, consistent and vulnerability-free software installation experience every time you ship. Integration with InstallShield, InstallAnywhere or any standalone software installers makes open source risk assessment a standard part of your build process to automatically expose and assess vulnerability risks. Within minutes, you will receive an assessment of your operational risk along with a bill of materials of your open source and third-party packages allowing you to identify, and act upon, critical security vulnerabilities and IP compliance risks. To further reduce your open source software license compliance and security vulnerability risk, consider expanding the scope of analysis to include all the files in your codebase (source, binaries, media and others) with FlexNet Code Insight. To find out more about identifying the open source software in your product using FlexNet Code Aware please complete the form below.